Welcome to China Report's first Digital Report on the Beijing Concert Hall in its new Location, which is now under construction west and behind The Great Hall of The Peoples at TiananMen Square. 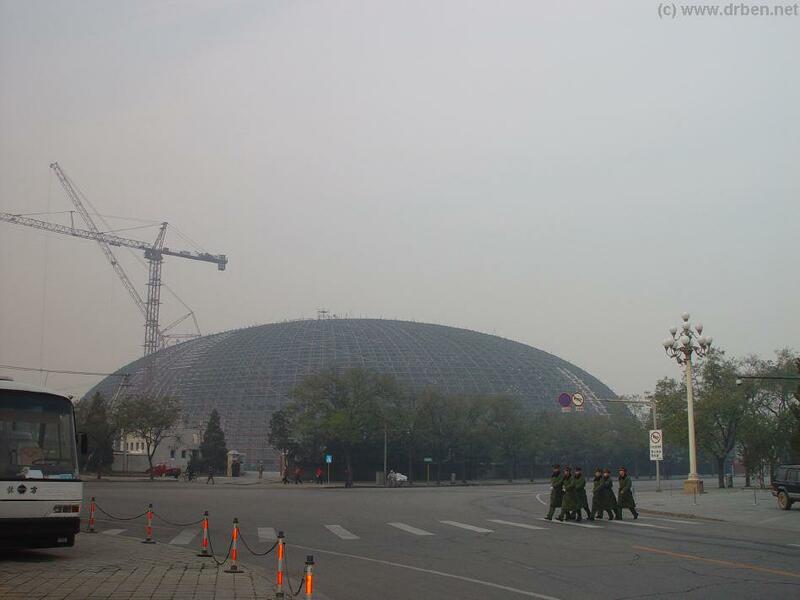 Not yet opened to the public , The New Beijing Concert Hall named National Theatre stands at the corner of Chang An (Eternal Peace) Avenue, Beijing's largest military style traffic artery and Renmin DaHuitang xilu (=Great Hall of the Peoples West Street), the street that runs north-south behind the Great Hall of The Peoples. It's former Historic location was slightly more to the West near Xinhua Men (Gate of New China) the South Gate to ZhongnanHai. will now be made the Central showpiece of this new and modern Olympic City. 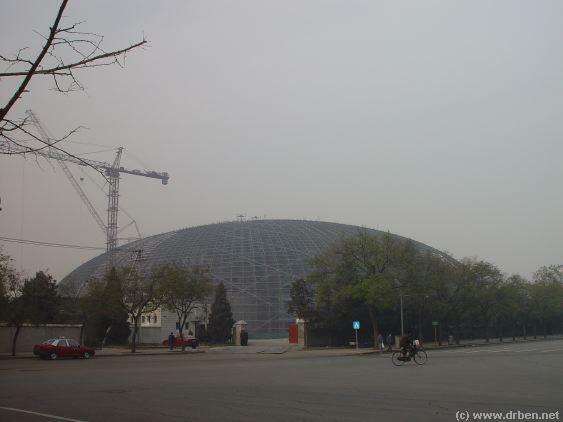 was renovated into Beijing's First official Concert Hall, all with the aim to promote New (= Communist ) China's music and to have a concert hall for official occasions, visits by foreign dignitaries and the Party Elite. 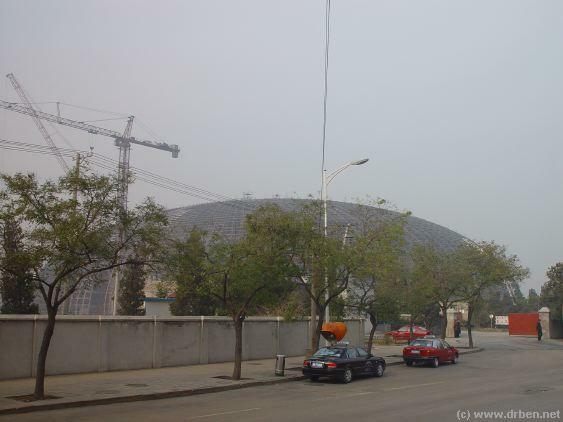 As such The concert Hall is home the China National Symphonic Orchestra, the China Opera Symphony Orchestra, the China Traditional Music Ensemble , the Oriental Song and Dance Troupe and many others. A delight of orchestral and chamber music concerts is frequently performed here, combining musics of Oriental, Western, classic and modern Styles. All music is performed at the highest levels possible giving the listener and spectator a rare taste of the best Chinese performers. China's leaders have always been lovers of classical music - chinese and other - and are regular customers. The proud New National Theatre will not only offer new Space to the Concert Hall , but will house a Cinema, a Theatre and more. 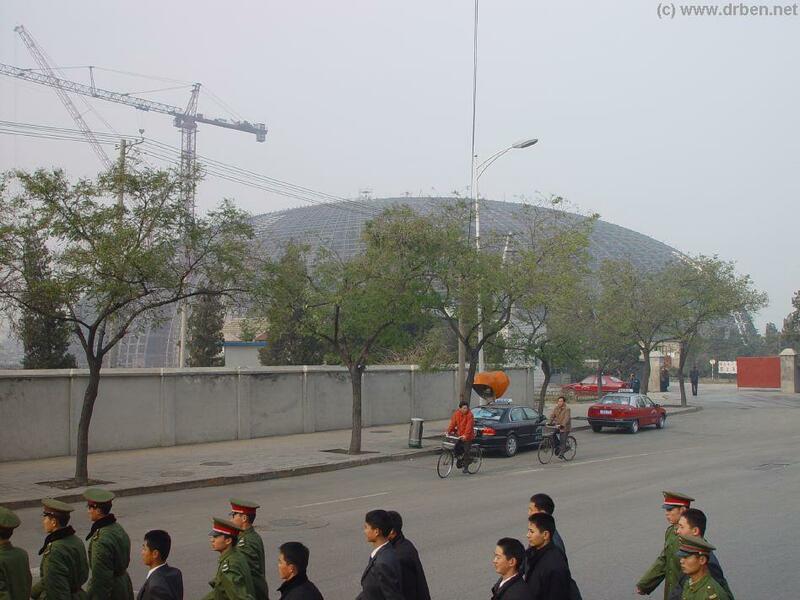 Young Men of the communist volunteer youth & Armed Guards march from The Great Hall of the Peoples to their barracks at Renmin DaHuitang Xilu (= Great Hall of the Peoples West Street ). 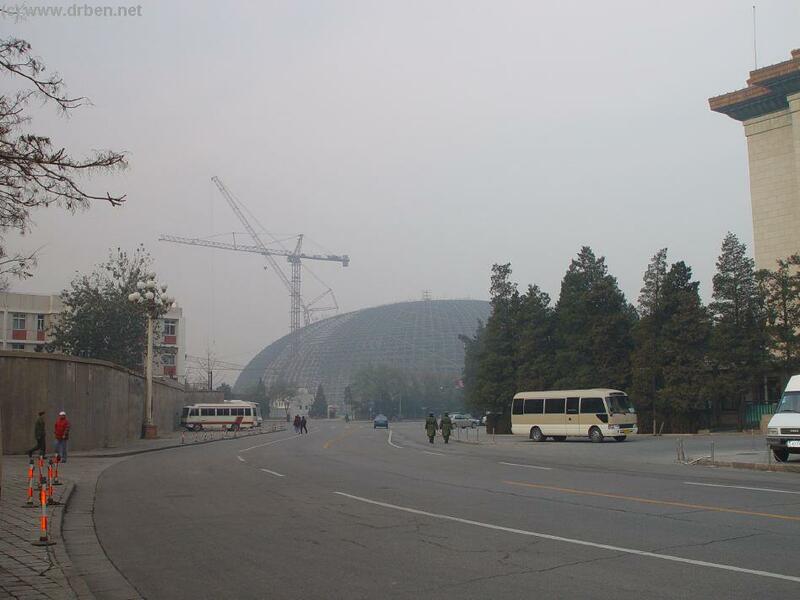 An empty Renmindahuitang Xilu and construction entrance to The Concert Hall. 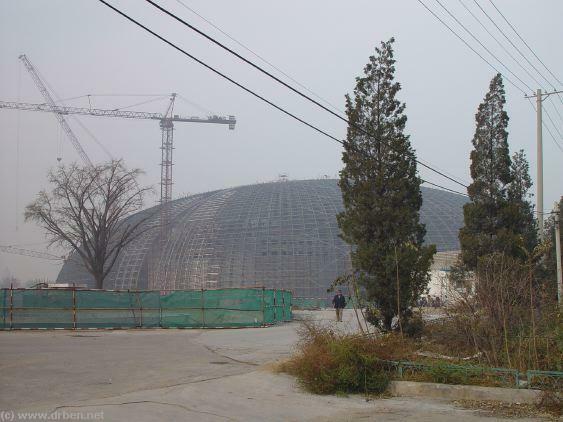 Nearly destroyed during the Cultural Revolution as an icon of "Rightist Bourgois-Revisionism" the Beijing Concert Hall has had as turbulent a history as the New China itself. Since its re-opening in 1986 after another re-building, the Theatre at BeiXinhua Jie' could seat 1100 visitors at 1 time. Eversince the Beijing Concert Hall has hosted many world famous musicians, as well as overseas Chinese artists including Tang Muhai, Chen Zuohuang, Hu Yongyan, singers Fu Haijian, Zhu Ailan, Dilibaier, Wang Yanyan and instrumentalists Xu Zhong, Kong Xiangdong and of course the earlier mentioned Beijing Symphonic Orchestra and others. In 1994 Mr. Siqing Lu, one of China's most celebrated and well-known Violin artists appeared at Beijing Concert Hall , a performance attended by Mr. Jiang Ze-min, the (then) President of China and broadcast live on television and radio stations throughout China. In 1995, Chinese pianist-virtuoso Lang Lang made a sensation by playing the complete Chopin Etudes at Beijing Concert Hall at only 13 years of age. The new Beijing Concert Hall can be seen under construction from its Future main entrance at Chang An ( Eternal Peace ) Avenue. 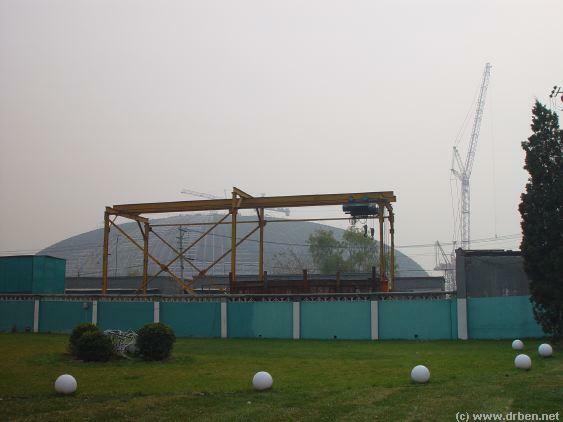 Large cranes are still dotting the Beijing skyline in all directions. The City's Metro or Underground Public Transportation system is undergoing similar modernizations as well as extensions in preparation for the coming 2008 Olympics in Beijing. Visual Centerpiece of the City modernization , the Beijing Concert Hall will have a new and modern Metro Station to get visitors to the theater easily. Simply stop at Xi Chang An station, take the exit Xi ( = West ) ChangÁn Avenue and you are there. Future Main Entrance at Chang An Avenue , Concert Hall building in progress. RenMindaHuitang Xilu , construction entrances to Concert Hall Site. Modernised XiDan Metro Station under construction at ChangÁn Avenue. 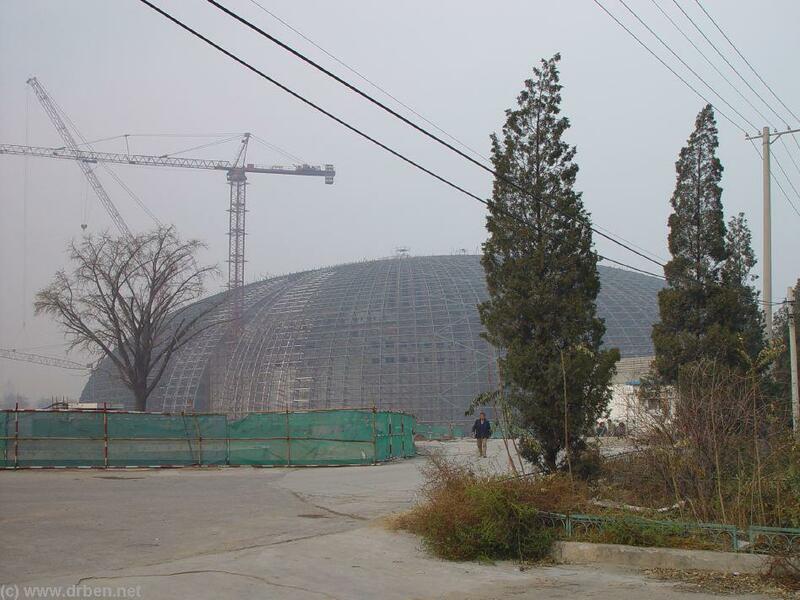 Now , with a new Era dawning and China, it's peoples and it's cultures entering the world stage , the Beijing Concert Hall is undergoing complete re-building to house a large world-audience , and begin a bright new future starting with the audience of the 2008 Olympics. 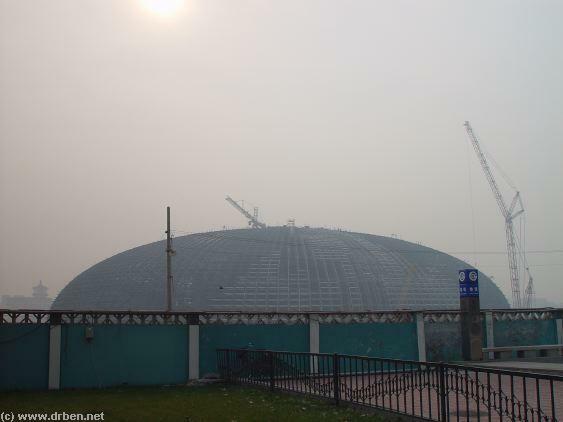 In this brand-new historic era of building modern civilization, it is ensured that Beijing Concert Hall - Now National Theatre (Dome) will evolve once again promising us a new Best of Chinese Music to come. Concert and performances are usually held each afternoon and evening. Performances include instrumental and vocal music, Western and Chinese. Various styles, highest level of arts performance. Foreign artist and groups sometimes visit , and do so with increasing regularity. Concerts at BeiXinhua Jie' Start at 7:30p.m. unless otherwise noted. Visit China Report Online Store ! Find out more about the Modern Architecture of the Future Green City of Beijing and visit the Beijing Planning Exhibition Hall (at QianMen DongDajie). The City of Beijng has been rapidly changing in this new millenium. New highrises are popping up everywhere and the Hutong are endangered. Find out all the Plans for 2008, 2010 and after at this Great Exhibition featuring a Hall-filling scale model of the Central City of Beijing.